Cool! My orks are painted yellow so i approve of this message! Interesting list, i will check it throughly. 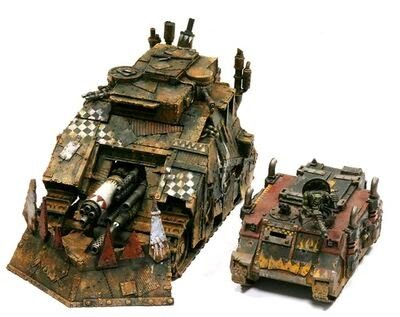 I am doing for fun and for playing in my group lists for the Ork main Klans, save Evil Sunz, Snakebite and Blood Axe for obvious reasons, and it is curious how different approach we took, even though we share some ideas. You got the flavour of the list by adding new units and special rules and i did by relying entirely on other ways. Both end lists are quite different but both still look different from other Ork lists while being Bad Moonz related. By the way, for making mine i have read beforehand every GW rule/army book i could find and i can tell you that every Klan has lots of Stormboyz, as it is a phase almost every teen Ork goes through. Not saying that you should put them back on yours, but that they can very well be in a Bad Moonz list. I wasn't aware about that with the stormboyz but it does make sense! What's the justification for Bad Moonz getting more Grotz? I'd have expected them to have the same numbers of them as normal but maybe a couple of the Boyz units in the core formation swapped out for Big Gunz. You've gone WAY OTT in how survivable you've made the Killl Krusha / Kill Bursta tanks. They're not all that much bigger than other tanks. Regular vehicle with 4+ Reinforced would be my suggestion for these instead. There are many more interesting points for list building on the books. For example Rogue Trader's two Ork books are very good for that and i found surprised myself with some parts. When i have the lists ready, i'll upload them. I was planning to do so for if anyone wanted to use them to begin with after they are more or less solidly made into the image i want to, but it will take more time, and i still have to do two more battle reports apart from today's release and probably a third soon will be added to the queue soon, apart from the Gargants i am sculpting, so very busy. Maybe around end of June I will have the lists fully prepared. By the way, i don't know if you know about but the FERC have their own Klan lists. They are almost like Ghazghkull's and there are some parts that i don´t see the point of, but maybe you want to take a look for yours just in case you find something useful. Oh, and found a typo. Twin big shootas are AP5+/AT6+ not AP5+/AT5+. And I agree with GlynG, they should be 1DC 4+ RA or even less, as they are not even half the size of a Fortress, and a bit bigger (50% more maybe?) than Epic 3ºEd Battle/Gunwagons, but you made them way tougher than one. Bad Moonz have the biggest number of Grot slaves in all Klans (with Death Skullz with the biggest number overall and meaniest ones, as lootas, thefts ans swindlers), that do from butler duties to carry things to battle to operate the larger and bigger in number machines Bad Moonz tend to have to show off. Because of that I made something similar to Kyussinchain idea also in my list' Warband, but I am always doubting if Grotz units in EA can be counted as part of the rich Orks' personal slaves, as i think that they won´t be directly on the battle and the Klan that has the more numerous and biggest Grotz (and Snotling and Squigs too) herds on the battle are Snakebites. The "Tellyporta" rule mentions "units" - does this mean that more than one formation can be deployed at the same time when it is used? Also, deploying within 15cm (instead of 10cm) of the scattering Teleportation point would be more in line with Marine Drop Pods as they very are similar in nature. Just my two cents. I really like how you've built a heavy infantry/walker list based on clan traits, it's a nice addition to the ones that already exist. Variety is the spice of life - looking forward to fielding it. Should the Flash Gitz' CC and FF stats be reversed? I just thought they'd be better at FF than CC. Is there another source for Meganobz except Vanguard? I like the heavy armoured Skinner Nobz a lot, but you have to buy a lot normal Nobz, too, to get a sufficient Meganobz. I´d go for some already tested rule for the Tellyporta Array. At the moment, it´s a bit fiddly, especially considering it´s an Ork rule! Seems to be a cpy an paste thing: The spacecraft have an armour save. Locking forward to see this getting further development.